L. Giraud-Badin, Catalogue de Livres Relatifs aux Beaux-Arts…provenant de la bibliotheque de Feu M. Löys Delteil,Paris, 1931, frontispiece (fig. 1). Friz Lugt, Les Marques de Collections de Dessins & d’Estampes, Amsterdam, 1921, vol. 1 (and reprint of 1975, San Francisco), under L. 773. Idem, Supplément, The Hague, 1956, under L2100b. Collection Paul Mathey, Catalogue des eaux-fortes et des dessins de Rembrandt van Rijn et estampes et dessins anciens et modernes composant la seconde partie de la collection de M. Paul Mathey, Hôtel Drouot, Paris, November 28, 1924, introduction. Born in Paris, Paul Mathey left school at age sixteen and became a student of Léon Cogniet. In 1867 he entered the atelier of Isidor Pils at the École des Beaux-Arts. With the outbreak of war in 1870 he joined the National Guard and participated in the Siege of Paris. From 1872 to 1875 Mathey worked on various decorative projects. Soon he became recognized as a sensitive painter of portraits and landscapes as well as a talented print maker. He first exhibited at the Salon in 1868 and was to win several medals, becoming in 1889 a chevalier in the Legion of Honor. Mathey’s portraits are known for their tasteful realism and flair, capturing, usually with just a few details, the milieu of his sitters. 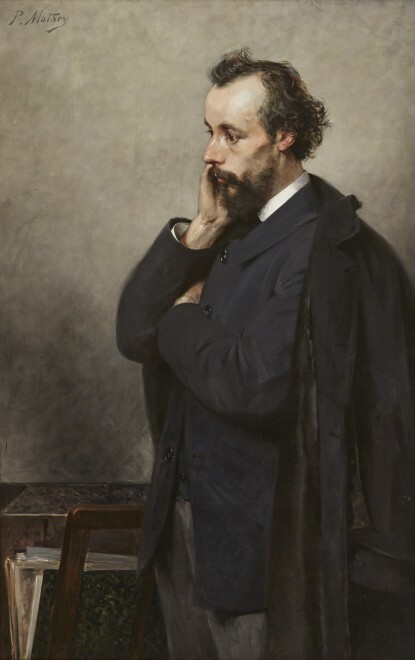 Among the famous who posed for him were Philippe Duc d’Orléans and, since he was a skilled musician, the composers Saint-Saens, Fauré, and Lalo, and then naturally many fellow artists and collectors, including a drawing of Degas and paintings and prints, of among others, Félicien Rops, Antoine Rube, Eugène Carrière, Alfred Stevens, and Georges Clairin (figs. 2a-q). In this portrait Mathey, himself a devoted print collector who compiled a substantial holding of Rembrandt etchings, depicts Loys Delteil (1869-1927), who was a collector, writer, and etcher, and is best known for his extensive 31 volume catalogue of 18thand 19thcentury printmakers. The “Delteil number” and his observations on states and editions is essential information on any number of notable printmakers including Daumier, Toulouse-Lautrec, and Pissarro. Delteil also authored many auction catalogues including in 1924 the collection of Paul Mathey, so sitter and subject were quite well acquainted, accounting for the unusual intimacy of this portrait. Delteil had begun collecting prints at age thirteen and quickly established a reputation as a connoisseur and expert. In 1898 (age 29) Delteil actually etched his own Self-Portraitat work, magnifying glass in hand, copying his reflection in a mirror (fig. 3). In Mathey’s painting he appears younger, thinner, and with more hair, so it probably dates to the early 1890s. There is a wistful air to Mathey’s portrait of Delteil. Head on hand, he seems lost in thought as he pauses in thumbing through one of his many portfolios of prints. Perhaps the enormity of his tremendous undertaking weighs heavily upon him and has made him pensive. With great dexterity Mathey captures both the expression and the texture of hair, skin, and beard. The flesh tones form a striking contrast to the dark clothes and shadowy setting. Unlike some of the other exuberant artists and collectors Mathey depicted, Delteil is clearly a very serious gentleman.